With Kreskin’s foresight that online graphic design will eventually swing back around to the geocities-era of the internet, the site will probably lure a niche market of older folks who have seen, captured or smelled a bigfoot or been abducted by time-traveling Atlanteans who need love just like the rest of us. Which brings up some questions: What sort of beings are looking for love? Will they all be human or other things in diguise? Are there vampires and werewolves worried about the fall out from a public tryst in light of the Twilight movies? Are there off-world species seeking to swing it with a human for a cheap thrill on their way to somewhere else? Are the reptilians using the site for some sinister plot? Will other creatures find that someone special without having to brave daylight, pitchforks and torches? Or is it just a bunch of lonely, probably really nice people just looking for a little companionship in a big and often harsh, ridiculing reality? And filling out the sign up page. Lots of ufologists, saucer-chasers and hunters of little green men became super-excited recently. John Greenewald of the BlackVault.com and his continuous efforts to petition the government via the Freedom of Information Act to release Project Blue Book’s files concerning strange things in the sky paid off in spades as thousands of documents were given to the world. Greenewald has put all of those reports in The Project Blue Book Collection, an archive on his site where you can sift through all of the files from the infamous UFO project created by the government decades ago. That excitement was short-lived when those same ufologists, saucer-chasers and hunters of little green men realized that all the secrets they’d been waiting for just aren’t there. According to a lot of online chatter in the extremely chatty community of extraterrestrial enthusiasts, it’s all gone back to square one because of censored documents and allegedly missing reports of some of the more infamous ufo cases. Is this just a handout to keep the noise level down on a vast, active community who believe aliens are already living among us? Is the government holding out on deeper, more pressing secrets? Or are we just alone on this little freaking blue marble and hoping that we’re connected somehow to something bigger than all of this? Everyone! Stop EVERYTHING! Right NOW! Our government, who is always up front on just about every issue you can think of, has just pulled the tablecloth from under our dinners by announcing that some place called Area 51 exists in the Nevada desert! Beside the eardrum-bursting sound of millions of people facepalming all at once there’s nothing but the sound of crickets and a whole lot of blank stares followed by just as many shrugs as everyone returns to doing whatever the hell they were doing before this announcement hit the wire. Sure it’s a ridiculous admittance of a place that most people who enjoy weird things hold near and dear to their little, strange hearts. No one’s really sure why it’s happening at this moment. Many of the UFO conspiracy theorists are already beating their chests that they moved the government to take this step because of the big UFO forum that took place in Washington, DC in early spring of this year. Others are already speculating that the government is prepping us for some kind of announcement that the alleged extraterrestrials often associated with Area 51 are already living among us. Right now everyone worth their salt in the conspiracy theory and UFO communities are poring over every word in the 407 page document (you can find the links right here) that’s been released and is basically the origin story of the infamously mysterious test site. Today’s a great day in government transparency! 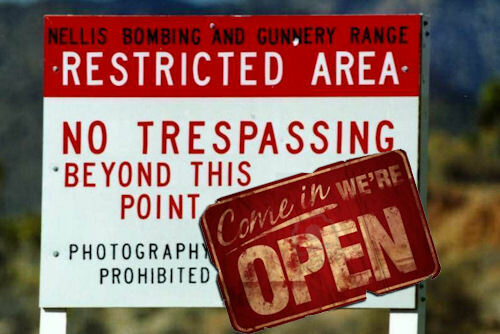 Who knew there was even a place mysteriously called Area 51? You are currently browsing the archives for the Area 51 category.